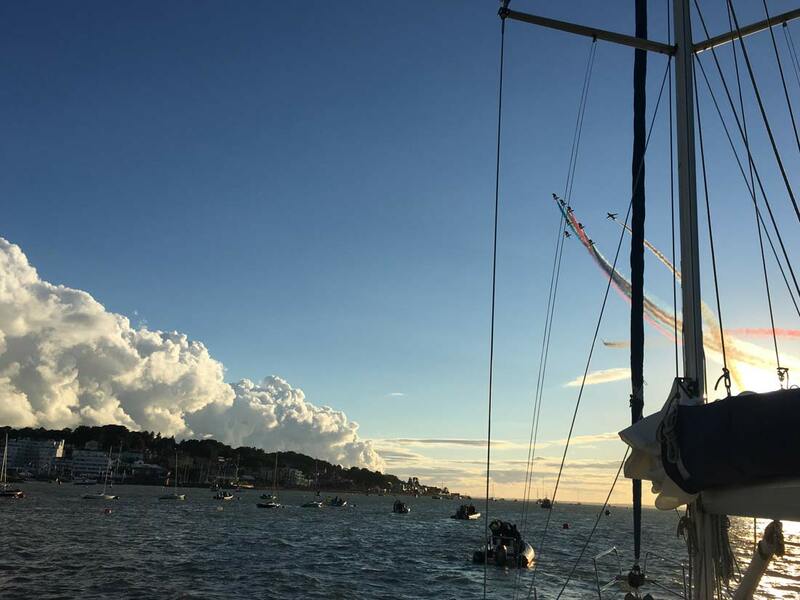 Richard, Rachel and Elizabeth Foulkes invited us to not one, but two very special evenings on-board last year – the penultimate and the last night of Cowes week. We headed out on a boat packed with food and drink; the first evening we mooched around just outside Cowes, listening to the radio to wait for the Red Arrows to fly by. Most of us have seen the Red Arrows at some point however to hear their engines and then watch them fly directly over the mast with a full view in all direction was the most amazing experience. We could see the pilots when they inverted above us, we watched the planes split over Cowes and then synchronise over Calshot, we saw them tumble, barrel roll and draw acrobatic hearts in the sky for us. An amazing evening equalled only by the following night when we shuffled and nudged our way to front row position to watch the spectacular fireworks on the barge outside Cowes where the reflections on the water doubled the colours and the air was filled with ooo’s, aahhh’s and ships horns blasting in celebration. A big thank you to the Foulkes clan. Jane, Tony, Jake and Henry.